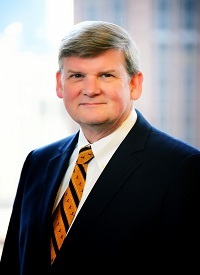 Paul G. Juettner | Greer, Burns & Crain, Ltd.
Paul G. Juettner is a shareholder with Greer, Burns & Crain in Chicago, and is an intellectual property attorney with three decades of experience in all aspects of trademark, patent and copyright protection and enforcement. Paul focuses his efforts primarily on international intellectual property portfolio creation and management, and he has consistently helped GBC clients grow their businesses and their IP portfolios domestically and internationally. Paul’s practice at GBC covers the full range of intellectual property legal services including registering, maintaining and protecting trademarks, domain names, designs, inventions and copyrightable works, worldwide; intellectual property due diligence studies and audits; license, joint development and other intellectual property agreements; opinions; trademark opposition and cancellation proceedings; internet enforcement actions; intellectual property litigation in the federal courts throughout the country; and alternative dispute resolution. Paul began his career as a civil engineer with Harza Engineering, having earned a civil engineering degree from the University of Illinois. In 1981, Paul was awarded a Juris Doctor degree with High Honors from the Chicago Kent College of Law. Later that year he was admitted to practice law in Illinois and became a registered Patent Attorney before the U.S. Patent and Trademark Office. For 20 years Paul practiced all aspects of intellectual property law with his father, Thomas R. Juettner, at their firm Juettner, Pyle and Piontek, where Paul was the managing partner. In 2000 the Juettners joined GBC. Paul is active in the Illinois Bar, IP law associations both in Chicago and internationally, and within the community. He is an active member of the International Trademark Association where he serves on the INTA Panel of Trademark Mediators. Paul is also a member of the Intellectual Property Law Association of Chicago (Secretary 2003-2004 and Board of Managers 2001-2003) and the International Anti-Counterfeiting Coalition. Paul served on the National Committee of St. Jude’s Children Research Hospital, Memphis, Tennessee, 2009-2014. He also co-chaired the Parish Council and building committee at St. Mary of the Woods parish in Chicago. He is an avid fan of baseball, barbeque and blues music.